The 64 suspected mercenaries who were aboard a cargo jet seized at the country's main airport could face the death penalty, Zimbabwe's foreign minister said Wednesday. Foreign Minister Stan Mudenge did not say what charges would be brought against them or when they might appear in court. "They are going to face the severest punishment on our statutes, including capital punishment," Mudenge said after a routine briefing for diplomats in the capital, Harare. 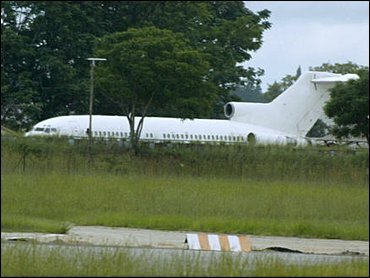 The crew of the aging Boeing 727, which was impounded late Sunday at Harare's international airport, claimed the plane was headed for the central African nations of the Congo and Burundi and was carrying mineral mining personnel. Zimbabwe authorities alleged the 64 were hired by a South African mercenary organization and British special forces, state television reported. The television said Tuesday that investigations in Zimbabwe found the plane was linked to a South African firm known as "Executive Outcomes" that in the past hired mostly former apartheid-era South African soldiers for mercenary and security work across Africa. The television quoted Zimbabwe Home Affairs Minister Kembo Mohadi as saying British SAS, or Special Air Service, forces were believed also to have been involved. He did not elaborate. Britain's Foreign Office said it was aware of the allegation. "The British government in Harare is following the developments closely. They attended a briefing by the Zimbabwean foreign minister this morning," said a spokeswoman, speaking on condition of anonymity. When asked specifically about the SAS claim, she said she had no further details. Relations between Britain and the government of Zimbabwean President Robert Mugabe have been strained since Mugabe began evicting whites from farms in a massive land reform project. A subsequent election was tainted by allegations of fraud and outright violence. Mugabe has shut newspapers and Human Rights Watch says his supporters have denied food aid to opposition members. Mugabe's chief rival, Morgan Tsvangirai, is on trial for treason and could face the death penalty. Zimbabwe was suspended from the Commonwealth of countries formerly part of the British Empire, and left that association last year. State TV said the plane was carrying 20 South African nationals and groups of Angolans, Congolese, Namibians and one Zimbabwean with a South African passport. Earlier, South Africa's ambassador to Zimbabwe, Jerry Ndou, was trying to verify the status of those on board the plane, the South African Foreign Affairs Ministry said. "Should the allegations that those South Africans on board are involved in mercenary activities prove true, this would amount to a serious breach of the Foreign Military Assistance Act, which expressly prohibits the involvement of South Africans in military activities outside South Africa without the due authorization of the National Conventional Arms Control Committee," South African Deputy Foreign Minister Aziz Pahad said in a statement released late Monday. The small west African state of Equatorial Guinea, where rich oil deposits were recently discovered, has said it is investigating reports foreign mercenaries were being recruited earlier this year to overthrow the government. Zimbabwe state television on Monday broadcast footage of a white plane with a blue stripe containing satellite telephones, radios, backpacks, sleeping bags, hiking boots, an inflatable raft, bolt cutters and what appeared to be a can of Mace. No weapons were shown. The plane and its passengers were taken to a nearby military airfield, the station said. The plane's registration number, N4610, is assigned to Dodson Aviation Inc. of Ottawa, Kan. A company official, Robert Dodson, told CBS News.com that he sold the aircraft to a South African mining company called Logo Limited about a week ago. According to the Federation of American Scientists, Executive Outcomes recently was involved in ending the Angola and Sierra Leone civil wars but is now defunct.